Maurice, Maréchal de Saxe, hero of Fontenoy, was not so much an "enlightened" freethinker as an old-fashioned sinner. Even the circumstances of his death in November 1750 at his château of Chambord were open to doubt. 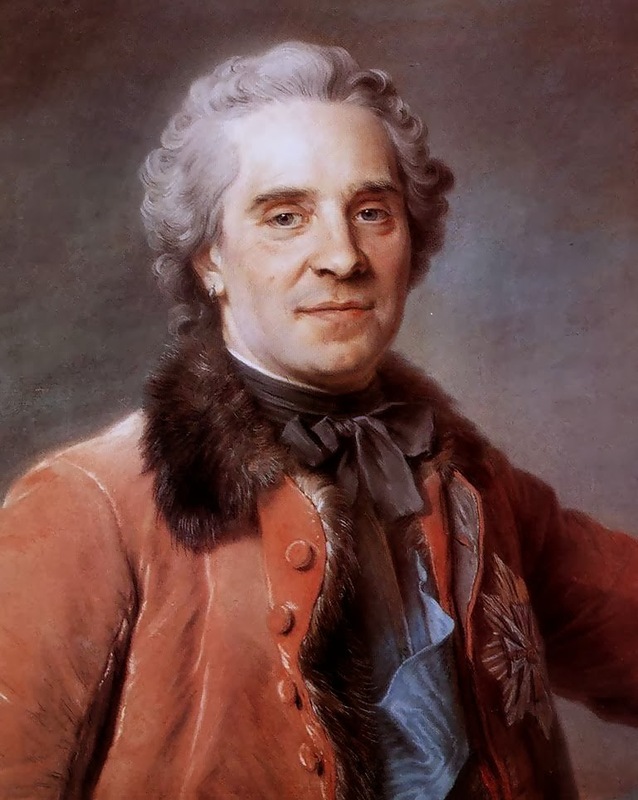 A serious fall from his horse three months earlier had opened an old wound in his thigh but he seems to have recovered and was planning a series of fêtes for a visit from Louis XV when, on November 22nd, he contracted a chill. He developed pneumonia and eight days later was dead. According to some sources at least the "chill" was caught on the point of the Prince de Conti's sword following a duel in the park. As Madame de Pompadour had it, "Saxe died as he had lived, believing in nothing and hoping nothing". As a Protestant, he escaped the attentions of confessors and he took not one bit of notice of the Maréchal de Lowendal's suggestion that he convert "to please the King". Jean-Bernard Sénac, his friend and physician, reported his last words: "Doctor, life is only a dream; mine has been a beautiful one, but it has been too short". Nor did the Maréchal care a fig about posterity. 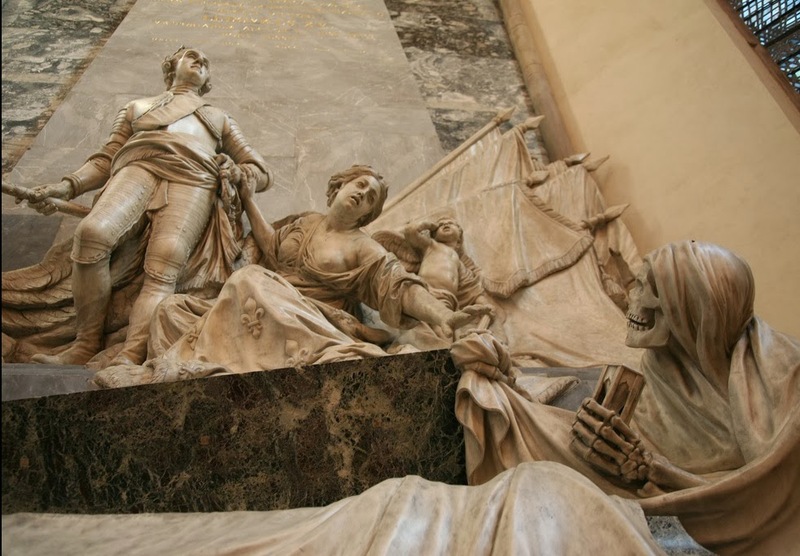 He left instructions in his will that his body should be buried in quicklime like his beloved Adrienne Lecouvreur, so that "in a short time nothing may remain of me in the world but my memory among my friends". That of course was not to be. France in the 1750s was painfully short of military heroes. 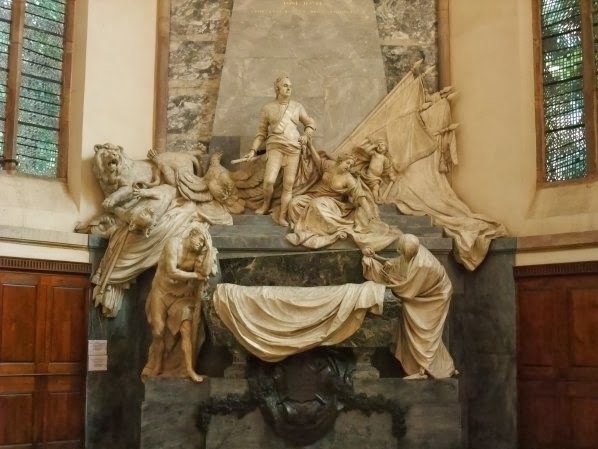 Louis XV, who was not usually prone to enthusiasm, wanted him interred at Saint-Denis among the kings of France, though in the end even he could not ignore the Church's interdiction on Protestants and had to settle for the splendid Lutheran Church of St. Thomas in Strasbourg. The body lay in state at Chambord until 8th January, then was conducted with great pomp to Strasbourg; it took a month to get there and vast crowds turned out to see it pass. The funeral was second in magnificence only to that of Napoleon in the history of France. Naturally a grand hero required a grand monument and in 1751 a competition was launched for the creation of the mausoleum. It attracted only two entrants, Guillaume II Coustou and the twenty-eight year old Jean-Baptiste Pigalle, protegé of Madame de Pompadour, who duly landed the commission. The result, over twenty years in the making then hauled in pieces from Paris, is enormous, glorious and more than a little absurd. Realism jostles uncomfortably with allegory. Maurice, in contemporary dress, marches proudly to his grave under the colours of France, trampling the standards of the enemy underfoot, whilst a lion, leopard and an eagle, representing the defeated nations, attempt a hurried exit from the field of victory. Further down a skeleton Death maintains a precarious foothold, beckoning the Maréchal with a grin to his open coffin. France, a destraught and indecorously dressed maiden, is already in full slide, saved only by a steadying hand on our hero's arm. In typical eighteenth century fashion the project was marred by undignified rankles over money which did little to enhance Pigalle's reputation. The young sculptor dragged his feet too over helpful suggestions from the king which seemed destined to further undermine the precarious unity of his composition. The fat cherub signifying Love was particularly resented, though, as wags pointed out, in this field too Maurice had scored notable victories. Even the Latin epitaph caused trouble - did it perhaps have Saxe dying shamefully in Cambridge, in the English Fens, rather than at Chambord? In the end no place was specified. I wonder what the Maréchal himself would have thought of all these machinations or of the splendid monument which still presides over the Temple in Strasbourg. Would he be secretly pleased to have his memory thrust on posterity, or would he be angry that his wishes were ignored? Perhaps he would be merely amused or, more likely, just not give a damn. On the epitaph, see John McManners, Death and the Enlightenment, (1981) pp.320-1.